Seeing all the kids in great costumes is probably the best part about Halloween for me. I always look forward to the little action heroes, sparkly princesses, and all sorts of spooky monsters coming to my door for a treat. Last year I had the opportunity to dress up my own little boy for the first time for a playgroup party. It was a riot to see him and his baby friends in tiny animal outfits, too little to understand how adorable they were! At one point, the older kids had a parade and I watched my cousin and his family happily march around as a band of pirates! Their son had a cardboard ship and everything! 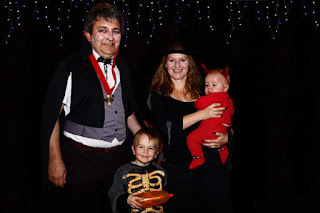 I was impressed at their effort, and found myself thinking, what other great family outfits could you pull together? I'm sure there are hundreds of fantastic ideas online if you looked. From elaborate fabricated cosplay to handmade fun on the cheap, there’s an ensemble costume for any budget, but where do you start? Here are 3 ideas that are inexpensive and look fantastic as a group. The reason this works so well, is that everyone can have their own character, but it looks even better when you’re together. Finding a little lion costume isn't hard to do, but a sleeper and a felt lion mane would be easy to put together. Mom might like to be Dorothy, but it would be a little funnier if dad did it! Have a puppy at home? Bring Toto along! There’s no better time of year to channel your inner Morticia than Halloween. Sweet and dark, the costumes are actually very simple pieces to pick up or make. Black dresses, black wigs, a little pale make up… a great way to be recognizably spooky. On the other side of the spectrum, why not be super happy and dress up in all colours of the rainbow! A troupe of children’s performers, the Wiggles dance and sing, each in their own monochromatic jumpsuits! Any member of the family can be any colour they like – no worries about size or gender – any 3 or 4 will get your point across to your target audience. Silly or scary, funny or strikingly beautiful, costumes should be a fun way to express yourself creatively and try something new. Don’t over think the process; you’ll just end up stressed and unhappy. Let your kids be involved creatively and enjoy the time together. Oh, and take lots of pictures! Many years down the road, when your family is not so young, you can laugh at the memory and smile because it happened.